This ornament, is based on a variation of the Log Cabin quilt block. It has a “scrappy” look, using different threads from my stash for each bar. The design is easy to vary. If you make it from all Scotch Stitches instead, the ornament will be larger. You can make the design more dramatic by making the three borders a different color instead of shades of the background color. Changing the threads you use can also affect the finished look of the design. I love projects like this as a way to use up threads from my stash. 1 skein each thread in one color family (color family #1) or 6-24 different scrap bag threads, 1 skein each threads in a second color family (color family #2). 1. Begin in the middle of the ornament and stitch the Mosaics charted in yellow and olive using the lightest shade in color family #1 or two scrap threads. Notice that the stitches at the end of each arm are Half Mosaics. The direction of these stitches determines whether the Mosaics in the are Mosaics or Half Mosaics. 2. Stitch the Mosaics charted in orange and fuchsia using the medium shade in color family #1 or two scrap threads. 3. Stitch the Mosaics charted in burgundy and red using the dark shade in color family #1 or two scrap threads. 4. Begin to stitch the background by stitching the square background areas, charted in sky blue, using the pale shade in color family #2. All of these stitches are Mosaics or Reverse Mosaics; there are no Half Mosaics in these areas. 5. Stitch the inside border, charted in aqua using the light shade in color family #2. The stitches in all the borders will change direction as they go around the ornaments. 6. Stitch the middle border, charted in blue, using the medium shade in color family #2. 7. 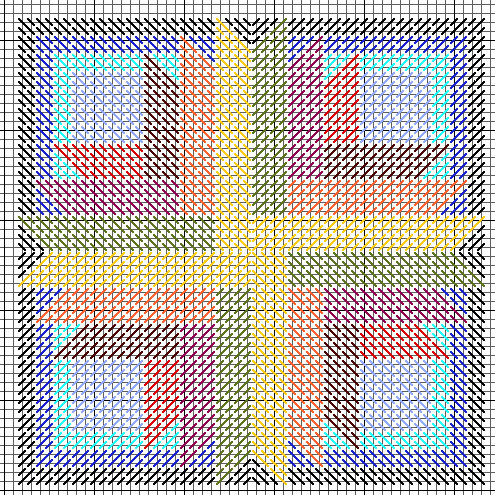 Stitch the outer border, charted in black, using the dark shade in color family #2.